This entry was posted in Uncategorized on July 4, 2018 by george. Same to you, George. Any big plans? Barbecue? We’re going to the Big Ballpark in The Bronx this afternoon to see the Yankees host the Braves, then will stop at a favorite barbecue place in Times Square on the way home. Then we’ll come back and watch 1776 as we do every year. Jeff, we’re headed back into the 90s today so it would be hard to pry me away from the A/C. Diane is planning a menu hamburgers, hot dogs, sausages, pasta salad, watermelon, and ice cream for dessert. Back at you, George, for you and yours. Jerry, Happy 4th to you and your family, too! I think the apostrophe is actually part of the fireworks graphic. I’ll probably just go up on the roof and throw firecrackers at the neighbor’s dogs. Dan, 50% of the people who show up at the Emergency Rooms today will be there for fireworks related injuries. Be careful! Have a great one, George. Patti, same to you and Phil! Happy Independence Day, George and Diane. You’re having hot dogs and sausages. Hot dogs ARE sausages. I guess you mean brats, which of course you’ll be grilling along with those hamburger patties. We’re having burgers, deviled eggs, potato salad, corn on the cob (plenty of starches, anyone? I’ll be taking meal insulin) and for dessert, brownies and ice cream. Barbara will watch the fireworks shows on TV – A Capitol Fourth, etc. plus a local one is broadcast, while I will be in an interior room with a pillow over my head. I don’t like loud noises. I just hope idiot neighbors don’t blow anything up or start any fires. We already have several wildfires in the state and it’s very dry. Rick, the sausages are actually Italian sausages. They come in two varieties: mild and hot & spicy. Diane prefers the mild and I opt for hot & spicy. I’m not a fan of brauts which I find too bland. Your brownies and ice cream sound yummy! Deb, what’s on your Fourth of July menu? Actually, this is the first 4th in years that we’ve gone out to eat. The band John plays with had an afternoon gig and—with one daughter in Houston and the other two out with their respective boyfriends—when he got home, we ended up having fajitas at a local Mexican restaurant. And there’s an unexpected bonus: an Elvis impersonator is performing here tonight! Deb, sounds like fun especially the Elvis impersonator. 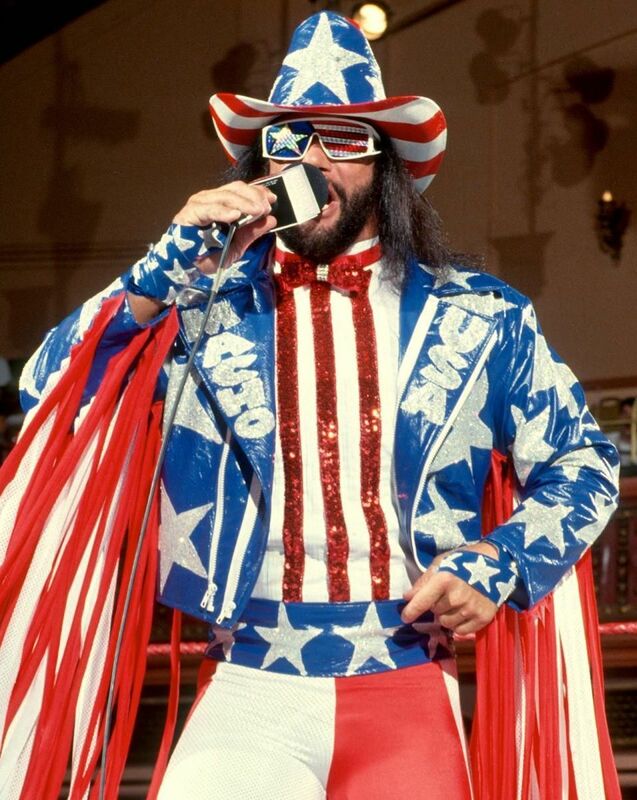 Bet you he sings “Just a Hunk, a Hunk of Burning Love” on the Fourth! It was interesting. The Elvis impersonator did a lot of later Elvis—songs that he did in concert in the 1970s but never recorded in the studio (that I’m aware of) such as “Bridge over Troubled Water,” “Let Me Be There,” and “You Gave Me A Mountain” (written by Marty Robbins, perhaps best known as a song by Frankie Laine). I wouldn’t advise the guy to quit his day job, but it was a fun background for fajitas and fixin’s. Deb, I know it sounds funny but Elvis was an underrated performer. When I listen to his albums now, I’m continually surprised at how good they sound! Everything goes better with fajitas! Hope you enjoy your food (don’t eat too much though …) and the fireworks! In frustration I went to the travel agency and bingo! They had a special offer: flight to RSW and an apartment in Ft Myers Beach (I was alone at the time after my first wife’s death) for an unbelievable price so I just had to go – and I saw the fireworks at the beach of Ft Myers, really great! Wolf, more and more people buy fireworks for the Fourth of July. It will be a noisy evening in my neighborhood! That’s pretty limiting. Of course many people ignore the law, which is why there are many fires and injuries every year. You can’t buy ANY fireworks in Portland, but surrounding cities do have those fireworks stands. Rick, for years New York banned the sale of fireworks (that didn’t stop New Yorkers from going over the border to Pennsylvania to buy fireworks). Then, a couple years ago, legislation was passed to make fireworks legal in New York. Now we have a lot more noise on the Fourth…and more injuries due to fireworks. It has been surprisingly quiet here this year, probably because they ran all of the Russkies out! My dogs are upset by fireworks so I don’t appreciate them, and I shen no tears if some knucklehead blows off a finger or two! Happy 4th. Bob, I’m not a fireworks fan, either. Bob, I feel with you! Also, they are ridiculously expensive, from what I’ve been told, and they are dangerous. Rick, fireworks are pricey and explosive. I remember when we were kids, my brother would set off packs of firecrackers and throw them near old ladies to scare them. He always was a little SOB in those days. One winter when it snowed, he was throwing snowballs at passing buses, when he missed and hit a taxi. The cabbie chased him down and beat the crap out of him, deservedly. I’m pretty sure those days are behind him. When we lived downtown in Carroll Gardens in the ’70s (before the average resident changed from an older Italian American to a Midwest transplant under 30), they would go nuts on the Fourth. I remember one year coming home, only to see a wire street garbage pail pulled into the middle of the street, filled with all kinds of fireworks, and set alight. We had to wait for it all to run down before they cleared the street and let us pass, Fortunately, Bay Ridge is nothing like that, only the occasional jerk shooting off stuff. This year has been very quiet so far. Jeff, since they legalized fireworks in this area, sales have gone through the roof! I can hear explosions a couple blocks away! A few years ago my German hometown Tübingen like many others forbade fireworks in the center of town- why? We didn't want that to happen again! Wolf, I’m convinced the people who buy fireworks want to create a lot of noise. Plenty of explosions last night! Now for something different – don’t know if this will upload.